At Lodge Bros Stonemasons, we understand that finding the right memorial monument for your loved one is an important task. After all, your chosen monument should have a timeless quality while reflecting your loved one’s personality. Fortunately, we offer a wide range of cemetery monuments in Melbourne to choose from, including marble monuments and natural stone monuments. Thanks to our tasteful and iconic cemetery monuments Melbourne family members can select the right monument for their loved one. Our monumental masons offer a broad selection of natural stone monuments in Melbourne, including granite and marble monuments. Available in a variety of colours, designs and finishes, our monuments are made from the finest quality stone. Choose from our wide range of granite or marble monuments from single monuments through to double monuments and even triple monuments to create a lasting memorial that is truly fitting for your loved one. 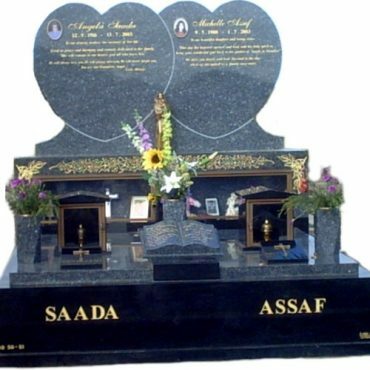 We can even supply custom family cemetery monuments and memorials in Melbourne that can be personalised to meet your specific requirements. Thanks to our years of experience and professional knowledge the team at Lodge Bros Stonemasons strive to provide our clients with a complete, high quality, and respectful experience. Crafted from superior and blemish-free bronze our team also offer bronze memorial plaques in varying sizes and styles to suit the memorial or monument they are attached to. Perfectly complementing the design of the monument and reflecting the emotion of the memorial one of our bronze plaques will be a fitting tribute to a loved one. 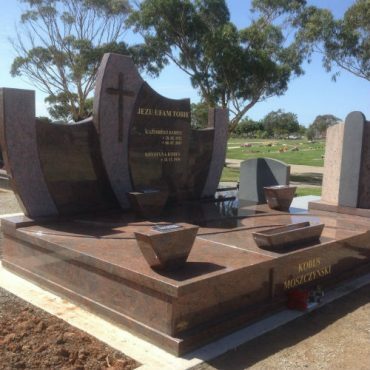 Why Choose Us for Cemetery Monuments in Melbourne? At Lodge Bros Stonemasons, we boast many years of experience, giving our monumental masons the necessary skill and expertise to craft the highest quality cemetery monuments in Melbourne. 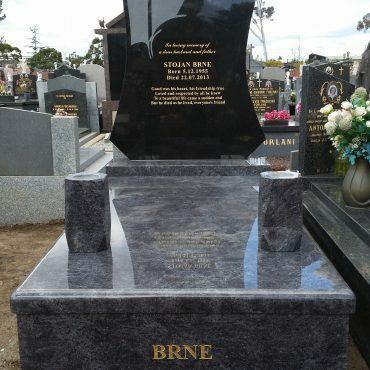 Whether you opt for a plain granite monument or choose white marble family monuments and memorials that are adorned with engravings, pictures, statues and vases, we will ensure the end result meets your needs. We understand that this is a difficult time for you, so you can trust that our skilled and compassionate staff will work closely with you to assist you through the selection process. Our skilled and respectful stonemasons can craft unique and expressive cemetery monument designs in keeping with our client’s desires. Established in 1918, Lodge Bros Stonemasons has produced many quality building works and natural stone monuments in Melbourne for a range of clients. With a focus on delivering outstanding quality, we are proud to have worked with city councils, cathedrals and universities to produce, renovate and restore beautiful works that are everlasting. Through our granite grave monuments and memorials you will be able to better memorialise your loved one for decades to come. To enquire about our granite and marble monuments in Melbourne, please don’t hesitate to get in touch our friendly team today. Call us on (03) 9497 2400 or contact us online through our enquiry form.